Pasta al forno (baked pasta) is to Italy what macaroni and cheese is to the rest of the world. In the good, homemade, festive way, not – heaven forbid – in the Kraft dinner way. I was amazed to discover that the recipe was originally imported to the US by no less than President Thomas Jefferson in 1802. He even had Parmigiano and pasta imported from Italy as he was not satisfied with locally produced ingredients. Note: pasta and Parmigiano, no Cheddar. Sadly the upper class appeal of pasta baked with cheese and butter disappeared already in the middle 1880s. My guess is that it kept in a free fall until today’s microwavable abominations. If you live in North America, you probably know all the above. As for myself, I can’t wrap my brain around the idea of a neon-orange dry cheese-flavored sauce in a prepackaged pasta mixture. The only idea gives me brain fog. Hopefully you are here because you want to know how to make an authentic baked pasta, one that you will find in many Italian houses, particularly when in need to feed a crowd, from a summery garden-party to Christmas or other holidays. use good quality pasta, possibly bronze drawn and cook it in plenty salted boiling water for half of the time indicated on the package to avoid overcooking. For example, if the pasta package indicates 10 min, cook it for 5 min. If it’s gluten-free pasta you might need to cook it one minute less than half time. instead of peas, use seasonal vegetables, saute with garlic, roasted or lightly steamed so they keep crunch and color. use only one or two types of vegetable in a recipe. This gives a more refined and decisive taste. If I combine two vegetables I tend to use them of approx. the same color, e.g. asparagus and zucchini, mushrooms and squash. Don’t overload it with condiments. You want to attain a balance of texture and flavor not a gloppy blob of fat. Less is more. It’s a great recipe because you can change it with the seasons and you can prepare it in advance which is always a bonus when you have guests. It actually improves if you bake it until warmed through, cool off and refrigerate. Just finish it the next day before serving. As you see from the recipe I use a modest amount of meat as a flavor enhancer. Pork can be substituted with stewed game or a slow cooked beef ragu with no tomato. You can also easily make it vegetarian by using some smoked or blue cheese or a little black truffle. 2 and 1/2 cups Béchamel sauce made with 1/2 lt ( 2 cups) milk, 30 gr (2 tablespoon) corn starch and 30 gr (2 oz) butter. Over low heat and covered, saute onion in a large pan until slightly golden. Increase the heat, uncover and deglaze with a few tablespoon of white wine. Add peas and 1/2 cup water and boil quickly until they are cooked through but still bright green. Remove from heat and add the chopped ham. Make a fairly thin Béchamel using my quick microwave method, see here. Cook pasta in plenty salted boiling water until half of the cooking time. 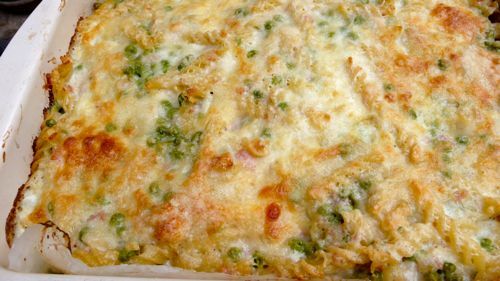 Drain and toss with half of the Béchamel, 2/3 of the grated cheese and all the peas and ham. Line a ovenproof pan with oiled parchment paper. This pasta tends to stick even in non-stick pans. Make layers of the pasta mixture and the mild cheese ending with a layer of pasta, a layer of Béchamel and a generous sprinkle of grated cheese. Bake at 200 °C ( 390 °F) until slightly golden on top. Next Post Happy Holidays! Buone Feste! 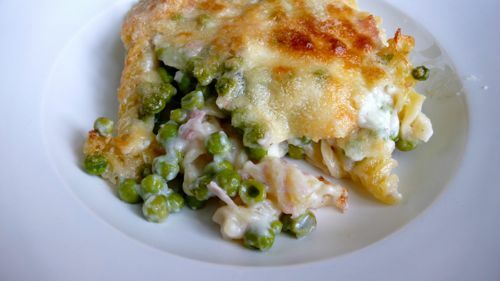 Pasta al Forno is such a comforting dish and I like the way you have used peas in this one. “The rest of the world” is not America. Many parts of the world also have strong Italian traditions and pasta al forno is cooked in the Italian manner, although I do recull a nasty sludgy version of Kraft Dinner appearing around the 1960s. Australian food traditions are quite different from those of America. It’s sad when my little grand child asks for Easy Mac- I think it might be creeping back in. I am always on guard, making sure the littlies don’t have their taste buds polluted by these plastic versions from the States. It happens here too! Lots of prepackaged food! My daughter doesn’t like them as she always has real food at home but some of her friends live on that awful stuff. Food multinationals are the real dark powers of the world! How would you cook pumpkin if you intended to add it instead of peas? I have lots of delicious homegrown pumpkins that I’m looking for recipes for! HI Michelle, I love to roast pumpkin in a little olive oil, with onions and sage, it would be great for the pasta bake but please also lookup my other pumpkin/squash recipes! We followed your advice. We couldn’t get any sage (British supermarkets), so we used oregano instead but it was still very tasty. Thank you for reporting about it Michelle and glad to know you liked it!